Mary Bridget Hayes Allman, 101, of Monticello, passed away peacefully on Saturday, March 16, 2019 at Kirby Medical Center, Monticello. Visitation will be on Thursday, March 21, 2019 from 10:00-11:00 a.m.at the St. Philomena Catholic Church in Monticello. Funeral Mass will be at 11:00 a.m., Thursday, March 21, 2019 at St. Philomena Catholic Church in Monticello. The Reverend Fr. Bruce Lopez will officiate. Burial will be in St. Joseph’s Cemetery, Ivesdale. Mrs. Allman was born on October 17, 1917 at the farm home of her parents, Patrick and Catharine Ryan Hayes, near Emden, Illinois in Logan County. She married Dr. Joseph F. Allman on June 20, 1942 at St. Mary’s Catholic Church in Delavan, Illinois. He died on May 11, 1996. Mrs. Allman was preceded in death by her parents; four brothers, Leo; Fr. Patrick Joseph Hayes, A Roman Catholic Viatorian Priest, Thomas and Gerald, lifelong farmers in Central Illinois, and a sister, Dr. Margaret Hayes professor at Loretta Heights College. Beloved to her family as “Mimi,” Mary’s long, contributive life progressed from a one-room elementary school, (about a two-mile walk from home) to graduation from San Jose Community High School in May 1935. She entered St. Joseph Nursing School in Chicago, graduating in the fall of 1938 with her Illinois Certificate of Nursing. 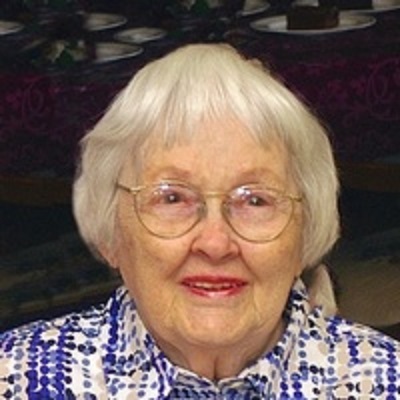 During World War II Mrs. Allman was an active member of the American Red Cross while her husband was in the Pacific as a U.S. Navy medical officer, serving with the U.S. Marines Corps. A homemaker who also worked in her husband’s Monticello medical office, Mary was a founding member of and actively served the John and Mary Kirby Hospital Auxiliary. She was also a faithful supporter of Monticello’s St. Philomena Catholic Church, volunteering and contributing for many years to parish organizations and activities. Mrs. Allman enjoyed her time with family and traveling with her husband to visit them on assignments in Europe. She followed sports on television enthusiastically, especially the Illini and other Big Ten universities attended by her grandchildren. For her family and others who knew her, Mary Allman was a quiet, strong, steady and positive influence in their lives. The family appreciates the care given by the Piatt County Nursing Home, Kirby Medical Center, and Harbor Light Hospice. Please make your memorials to St. Philomena Church, Faith in Action in Monticello or the Piatt County Nursing Home.